This weekend I was digging through my old journals looking for one specific moment that I wanted to remember but of course flipping through these books took me a lot longer than I expected. I started reading old entries and just spending some time with my memories. 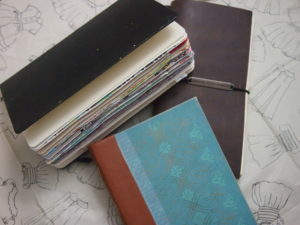 For those of you who journal, do you go back and read your old journals? I will revisit them occasionally but for the most part I’m spending time in the present with my current journals. Yes, I have several ongoing journals. I thought I’d do a little show and tell of my current journals. For my regular journal, which is the one where I work through my personal life, I am using a book I made. It’s a hardback book with a cloth spine and marbled paper. I love the pages because they are unlined and a nice quality of paper which is perfect for fountain pen ink. I also keep a Some Lines A Day journal. This is a five year journal which you are supposed to write in every day. I’ve had this for two years but I don’t write it in every day. I like to write silly stuff, sometimes a quote, or just a little something to fill in the space. My fauxdori journal, which is a term for an inspired Midori notebook. I bought after watching a lot of Youtube videos on Midori Traveler’s Notebooks flip throughs. I know a lot of people keep these as planners but I just journal in mine. What’s different from this one from my personal journal is that, I’ll put in receipts, cards, pictures, etc. So it’s almost more of a scrapbook. 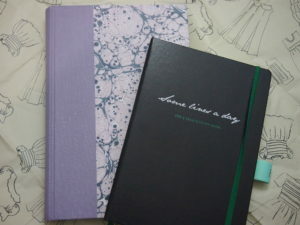 I also keep a poetry journal (the green one which I made) where I write down poems I’ve read that I love. I have favorites by Mary Oliver, Louise Gluck, and Rita Dove to name a few. My black moleskine journal is the one I use for art journaling. I collage, use spray inks, acrylics, etc. This one is getting messy and big. I love it. Along with these I also keep notepads, a Filofax Finsbury planner and a separate travel journal. You can tell I love to write! Granted, I don’t write every day but it is definitely a hobby that I’ve had since I was a child which only becomes more necessary the older I get. I hope you enjoyed this and maybe it gave you some ideas on journaling. So tell me, how do you journal? I’d love to hear about your experience. Thanks for sharing all your journals! The ones you made are really beautiful. I keep two journals, one a regular personal life journal and the other a garden journal. I am not in the habit of keeping a garden journal so every spring I start off well and then by July I have stopped writing in it completely. I am thinking of starting a cycling journal to keep track of workouts and bike adventures and training, nutrition, etc but I have not figured out how to set it up yet. I might end up just getting a wirebound page a day calendar. Not sure where I will end up yet on that one! I rarely ever look back through my book journals, but now that I’m posting a “Looking Back” blog entry every Friday, I’ve had fun revisiting my thoughts from 20 years ago. Ooops! Just realized I missed posting something today. The holiday threw me off!